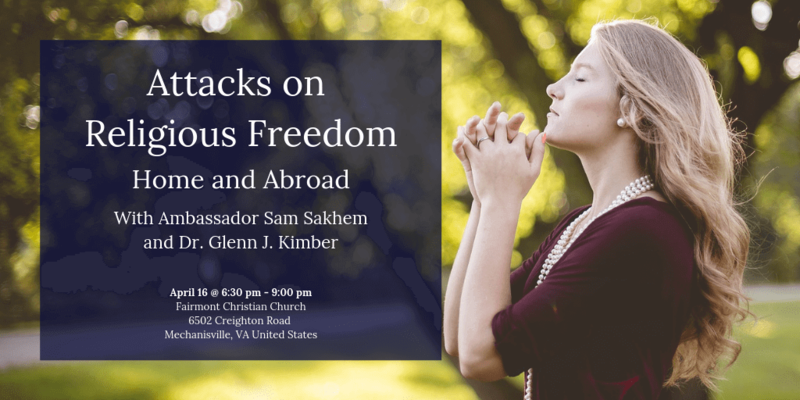 We would like to invite you to a special Religious Liberty Event for adults and teens titled, “Attacks on Religious Freedom—Home and Abroad” presented by Dr. Glenn Kimber and Ambassador Sam Zakhem on Tuesday, April 16th, from 6:30-9 pm at the Fairmont Christian Church, 6502 Creighton Road, Mechanicsville, VA.
Dr. Glenn Kimber is a nationally recognized Constitutional expert. He has conducted numerous tours and supervised archeological excavations in the Middle East for 30+ years, and in 2016, the Universal Peace Federation awarded Dr. Kimber the Middle East Ambassador for Peace Award. Ambassador Sam Zakhem is a Lebanese Christian, was the U.S. Ambassador to Bahrain from 1986-1989, served as the White House Advisor to the Peace Corps from 1985-1986, and served in the Colorado Legislature from 1974-1982. They are both very knowledgeable about the situation in the Middle East and are working to promote peace in the area. The Wesley Center for Constitutional Studies, www.johnwesleycenter.org, a non-profit 501C-3 organization focused on preserving our Religious Liberty and our First Amendment Rights, will be covering the costs of their flights to Virginia and their accommodations thanks to generous donations to the Wesley Center. Attached are the bios for these two exceptional men and a flyer about the Richmond event. Please forward this information to family and friends who would enjoy an invitation. All events are free and open to guests. It will be a special opportunity to hear Dr. Glenn Kimber and Ambassador Sam Zakhem speak on Religious Freedom! If you have any questions, please contact Sue by text or phone at 540-319-7700. We hope you can come!